This #1 National Best Selling Family Organizer offers an easy-to use paper format that helps even the busiest of families gain control of their active lifestyle. The 2019 Calendars are available May 1, 2018! 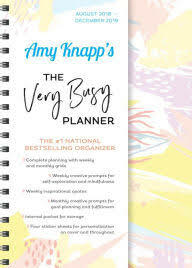 This year we are introducing Amy Knapp’s Very Busy Planner. It is a beautiful full color planner with bullet journaling integrated throughout. Order yours today! Amy Knapp’s bestselling planner is now all about YOU! This easy-to-use organizer helps even the busiest woman gain control of her active lifestyle. The format features weekly and monthly calendar grids, weekly to-do lists, inspirational quotes, color-coded stickers, and now bullet journal pages for even more individualization to give you what you need in a planner. 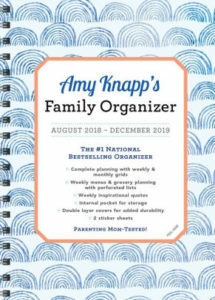 Amy Knapp’s Family Organizer is parent tested and mom approved! This easy-to use spiral-bound planner helps even the busiest of families gain control of their active lifestyle. This organizer features weekly and monthly calendar grids, weekly grocery lists, weekly to-do lists, inspirational quotes and color-coded stickers. 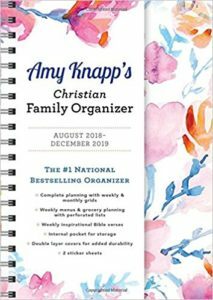 Amy Knapp’s Christian Family Organizer is parent-tested and mom approved! This easy-to use spiral-bound paper planner helps even the busiest of families gain control of their active lifestyle. This organizer features weekly and monthly calendar grids, weekly grocery lists, weekly to-do lists, inspirational quotes and color-coded stickers. This Christian Family Organizer also includes a weekly Bible verse and a Prayer & Praise section. 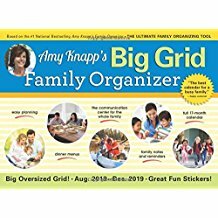 Amy Knapp’s Big Grid Family Organizer is an essential organization and communication tool for the whole family! There’s plenty of space on this calendar to track family schedules, activities, dinner menus and long term planning, plus colorful stickers to mark important dates. Helpful tips are provided each month. I LOVE your planner! I worked in a seasonal calendar store this fall and was able to compare yours with many others before I purchased. I am not even a family – just me, but it is such a good format, with such a perfect layout. I love the Menu planner next to each day…the Grocery list…the Full Month calendar as well as weekly…nice fonts and readability. So thanks for having such a well thought out planner! I’ll surely look for you for next year! I want to tell you that I’ve been buying these organizers for many years and save them all because once in a while I’ll look through them and go over things we’d done years ago and say “Oh wow, how time flies” and reading over the daily links to our lives in the past brings back floods of memories! 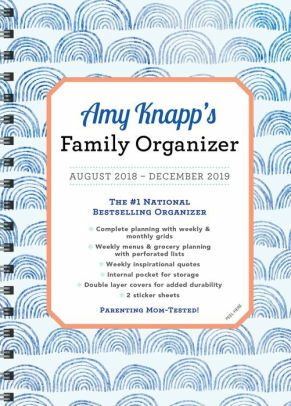 Is it time now to order my 2 or 3 copies of Amy Knapp’s Family Organizer?????? I’d be lost without these and I love your organizers! Thank you and God Bless You forever Amy for listening to me and always, always helping me!!!! Your planner is great and I am very grateful to find it. Thank you again. I was just getting ready to purchase a new organizer for myself and a friend for the coming year. Recently I had to refer to some information I had jotted down in last years organizer. I have kept them all!! I just wanted to show you some photos of how much I LOVE my Amy Knapp organizers. I’m a loyal customer. I would truly be lost without it. I have an iphone with fancy calendars and reminders but nothing beats the old fashioned way!! Thank you for helping me keep my day to day life operating smoothly! Not sure if you individually receive emails to this account, but if it’s really you, Amy, may I just tell you how much I enjoy using your Family Organizer calendar! I have used them for years and years and I never throw them away because they become sort of a diary, allowing me to look up events of the past and see when they actually occurred. Just like so many people have said, yours is the BEST system available. I have even given these away as Christmas gifts. 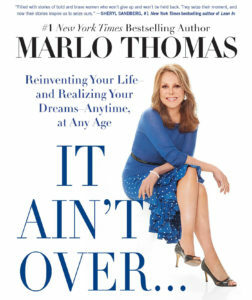 Amy Knapp is one of 60 women profiled in Marlo Thomas’ book who are proving that it’s never too late to live out a dream, meet a challenge, start a business or fulfill a childhood ambition. The story of the creation of Amy Knapp’s Family Calendar starts on page 279, where Amy demonstrates that necessity really IS the mother of invention.